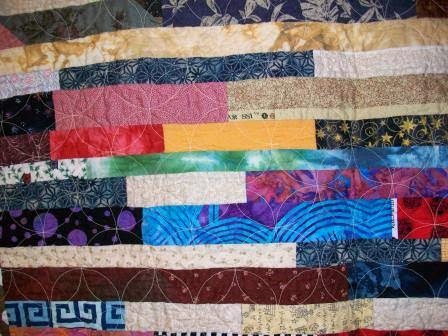 Nothing finished this quilt to share. 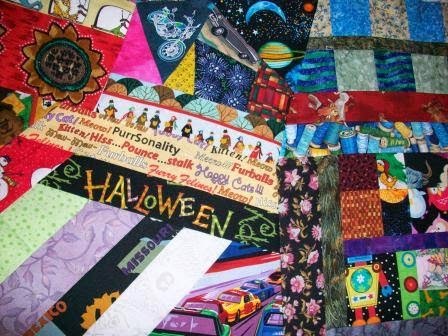 I'm working on another scrappy crazy quilt. I'm almost done piecing it. The finished size will be around 45 in X 60 in. Here are a view preview pictures. This first one has many areas of interest: tractors, cars, dogs, words, bookworm, and colors. This one has horses, more words, tractor, dogs,and houses. This one has carolers, sunflower, moon, more words, car, and robot. 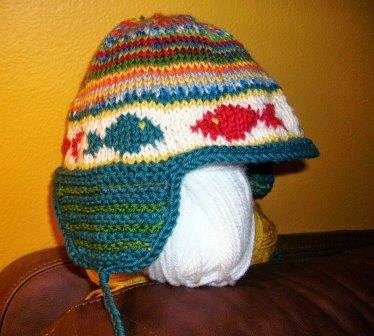 I love looking at finished projects others have done on Ravelry. 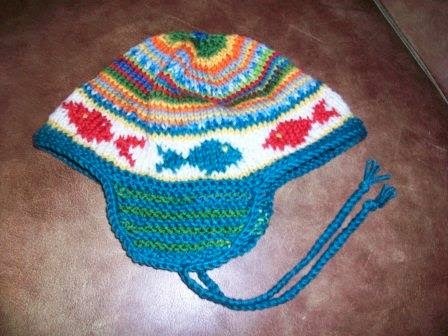 That's how I stumbled across the pattern for this hat (Fish Hat by Zoë Mellor). It lead me on a hunt for the book (Animal Knits) the patten is published in. I found the book for $0.01 on Amazon. Here is my attempt at the hat. I used various yarns from my stash. My tension is no where near perfect with the frequent yarn color changes. I actually took the fish segment out and redid it. It's better than the first knit-through but still not perfect. Here is another view. I sent it to a friend who has a grandson due in the near future. This quilt is made from the second quilt top Kate sent to me. I added a border to make it a bit larger. I'm not sure what the name of this quilt block it. The quilt is machine pieced and machine quilted. The finished size is 39 in X 41 in. 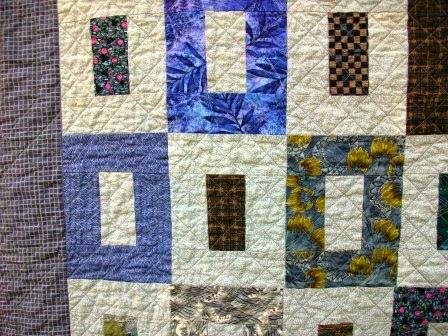 I found this lovely fabric (keeping with the blue theme) in my stash and used it for the backing. 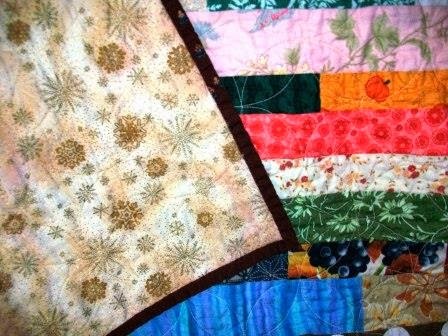 Both quilts have been sent to the Alzheimer's Disease Cooperative Study. 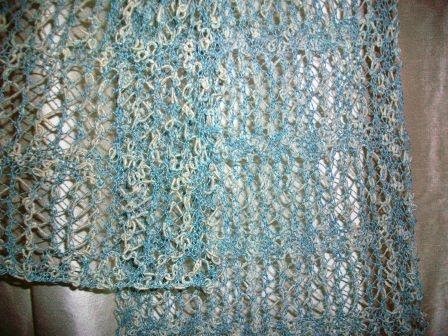 This is the fourth scarf I've made using this pattern (Wisp by Cheryl Niamath). It is a reliable pattern for a consistently lovely scarf. The yarn is the same yarn used for the Marly scarf (discontinued Reynolds Rosalie). 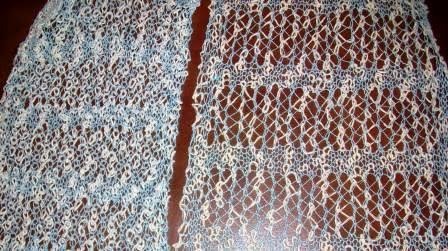 Here is a photo comparing the knitting before (on the left) and after blocking. What a difference blocking makes. Here is another photo after completing the blocking. And is a is (poor) photo of the entire scarf. The true color of the scarf is shown in the above photos. 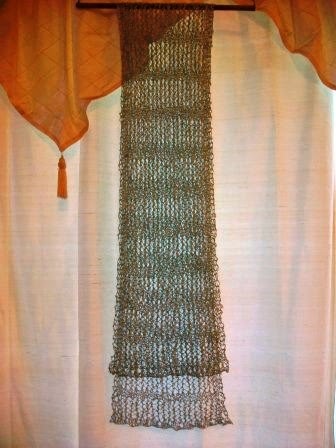 The scarf measures approx 9 in X 63 in. 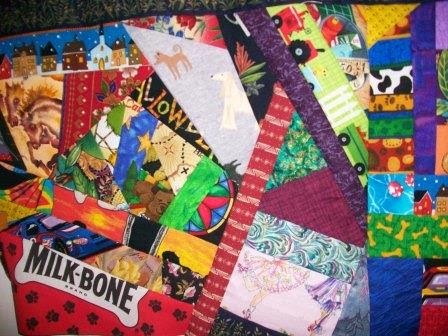 A few months ago I received two quilt tops from Kate. I recently finished quilting this one. 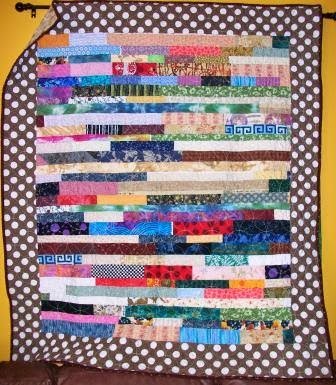 It is a scrappy strippy quilt. 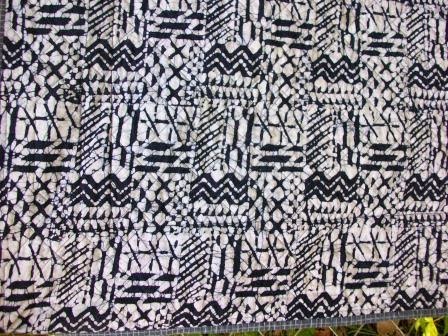 The quilt top was machine quilted. 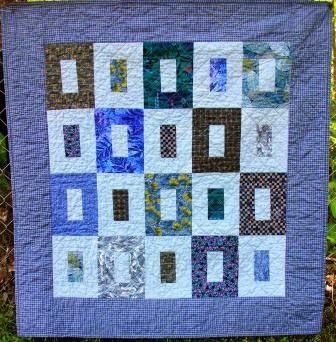 I did the machine quilting. It measures 47 in X 54 in. 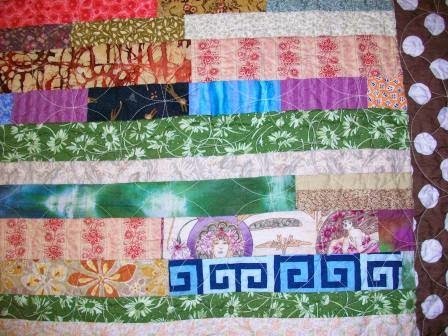 When I finish quilting the other top I plan to donate the two quilts to the Alzheimer's Disease Cooperative Study. Some lovely fabrics were used. 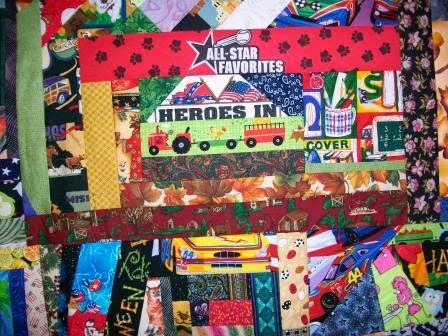 Here you can see more of the fabrics used. I found some lovely gold snowflake fabric in my stash to use for the backing.